On 02/12/2016 Microsoft released a version 2.0 of the KB article “The logon process hangs at the “Welcome” screen or the “Please wait for the User Profile Service” error message window” with which in one case at a customer resolved the issue know by me as the “Unnamed Disconnected Sessions” issue. 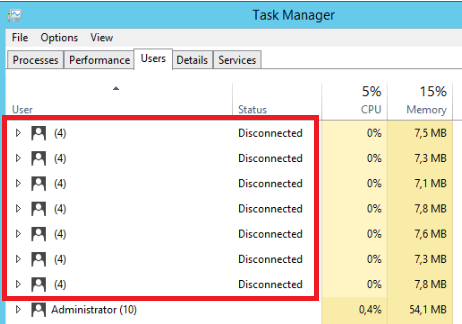 This issue shows it self when users are unable to logon to any of the Remote Desktop Session Host (RDSH) servers in a specific collection and the task manager shows unnamed disconnected users with only four process. Also visible was that the User Profile Disks (UPD) of the effected users were still mounted which meant possible UPD corruption was just around the corner because sometimes the only way to resolve this issue was to hard reset the effected RDSH. In this case the customer was using mapped drives based on DFS names and after installing the KB via Windows Updates the issues went away. Hopefully it will also resolve similar issues for you! 22 March 2016 in regular posts.